Crafting handmade flowers using a host of rich Indian fabrics and textiles, the Urban Flower Project has a selection of beautiful cloth flowers that are bound to make your space a little more cheerful and kitsch. Bangalore-based decor brand The Urban Flower Project is bringing some spring time freshness to our homes with its collection of handmade cloth flowers that last all year round. Working with Indian fabrics and natural dyes, the brand has a refreshing range of decor. From rosemary to poppy flowers, find garden favourites and wild flowers in their range of oversized handmade cloth flowers that are sure to breathe new life into your coffee table or bed stand. With long metal wired stems and stamen, their arts and crafts approach only adds to the overall charm of the product. Prices for these start at a cool INR 240. We’re big fans of their collection of flower fairy lights that make regular fairy lights look so passé. These quirky lights are just the thing to add a pop of colour and kitsch to your space. Pick from tiny bluebells, daffodils or red and yellow buds to be strung together with the dainty lights. 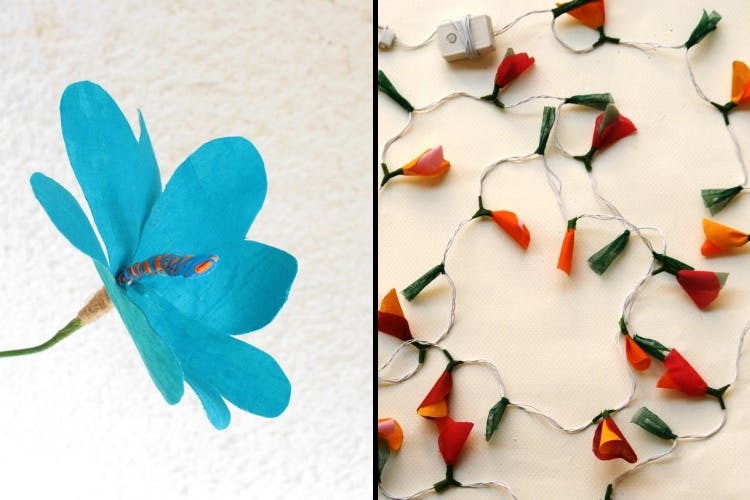 They also have an origami range where you can choose from colourful little origami flowers or fishes to envelope the tiny bulbs on your string of lights. Starting at INR 1,400 for a two-metre long strip and INR 1,560 for a string of lights that is double that length, prices may seem a little steep. But considering that every flower is painstakingly handcrafted and made with good quality fabric and reliable rice lights, the prices are fairly reasonable. Plus, these are bound to last much longer than the fairy lights you bought from your local gift store. Primarily operating online, you can check out their merch on websites like Unfactory here and make a purchase. So go ahead and score on some flower power.